The first time I drove in downtown Johannesburg, four and a half years ago, I heard an eerie, captivating song on the radio. I pulled over to the side of the street in a congested part of downtown, despite being alone and in a rental car -- both things I'd been darkly warned made me a sitting target for a carjacking. I rifled through my bag to look for something with which to write the lyrics down; the song would end soon, and I knew I had to find it again. The words were in an unfamiliar language, but I recognized again and again the word "Mandela": "Uh-SEEM-bonanza Mandela," it sounded like. As soon as I got home to Google, I found it: "Asimbonanga," an ode to the imprisoned Nelson Mandela written by a singer named Jonny Clegg in 1987. Clegg formed the first big-name integrated pop band in South Africa in the 1980s, in contravention of the apartheid government's rules. 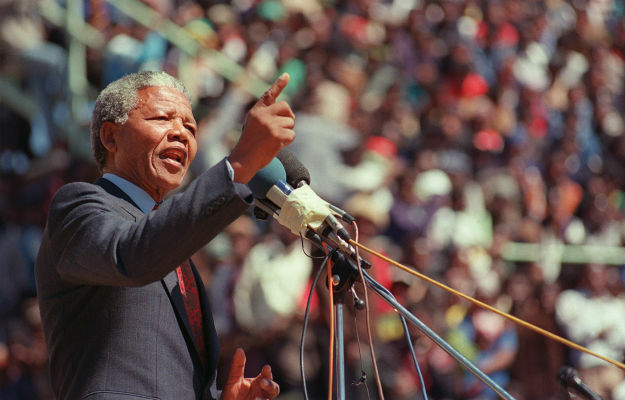 In moody, wistful harmony, "Asimbonanga" mourned an invisible leader: "We have not seen him, Mandela, in the place where he was kept," the Zulu chorus goes, referring to Robben Island, the prison in which Mandela was incarcerated for 18 years. (He spent the remaining nine years of his imprisonment in other jails on land.) The song's bereft singer tries to visualize the place where his shepherd is, somewhere across the cold sea, but fails. "We have not seen him, Mandela."